One of the perks of working for a magazine is you sometimes receive free samples, and recently, a box of 30 packets of powdered vitamins showed up on my doorstep. Meet UVO – the first drinkable sunblock. This little dynamo packet was formulated by Board Certified Dermatologist, Bobby Awadalla MD. to circumvent negative short and long-term effects of the sun’s harmful UV rays. 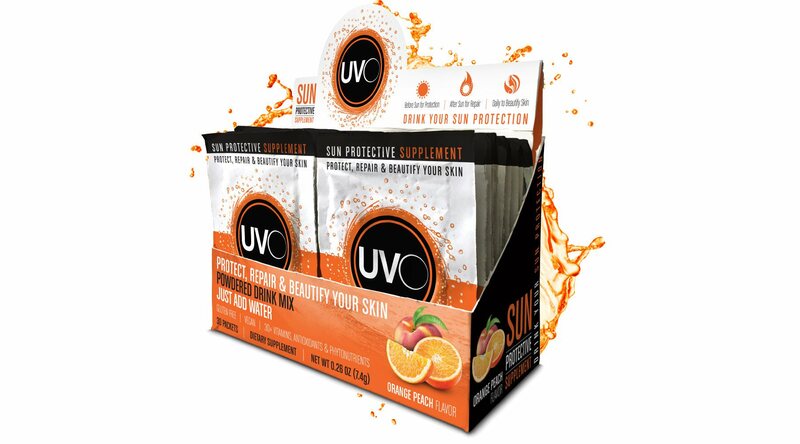 UVO is the first vitamin supplement specifically formulated to help protect and repair your skin from the inside out. I place the powder in a bottle – add water – shake it well – and drink throughout the day. With an orange-peach flavor, it tastes great, and I feel like my skin has improved over the last few weeks while I’ve been using UVO. (Don’t drink on an empty stomach if you’re sensitive). Yes, winter is headed our way, but in So Cal that doesn’t mean no sunshine. And perhaps your skin needs a boost after a summer of tanning? Plus, with no adverse effects, UVO is good for your entire body – so why not give it a try? UVO comes equipped with 30＋ vitamins, antioxidants and phytonutrients scientifically proven to help protect and repair your skin from UV damage.